The other day during a biology lesson, some grade 9 students asked me how long ago people came to Australia, so I pulled up a map showing the migration of humans out of Africa. The dates and routes taken by different groups of people sparked quite a bit of interest and conversation with those students. And then, voila, I encountered the post below from waitbutwhy.com. Follow this link for the full set of timelines, but be forewarned: not all of the language in the post is appropriate for school. 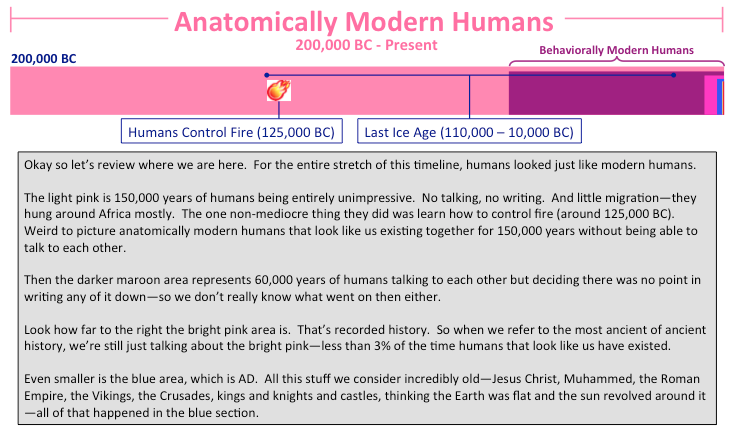 This entry was posted in Grade 9 Science, Random Thoughts and tagged cool stuff, evolution, geography, history, timeline. Bookmark the permalink.